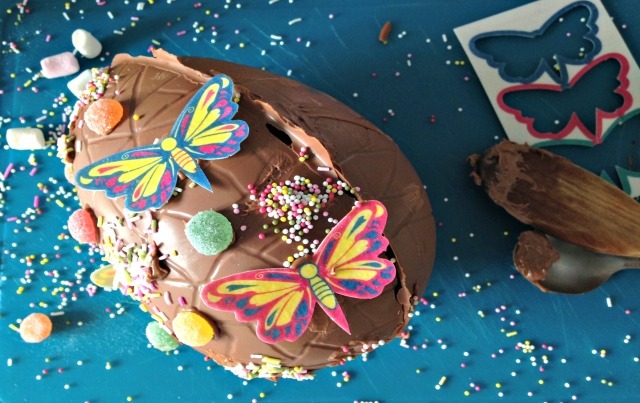 I have been eager to have a go at making our own chocolate Easter Eggs, it always looks like great (and messy) fun. In perfect time Waitrose very kindly provided us with some chocolate Easter Egg moulds and lots of goodies to make and decorate them with. I knew this was going to be a good activity for Lucas when I opened the box and he spent quite some time looking at the different tubs of decorations; he just couldn’t pick a favourite so we had a little test of some. The butterscotch was a hit and I loved the honeycomb pieces; I couldn’t quite persuade him to test some popping candy but me and my husband were quite excited about that one! After lots of taste testing and deliberation he narrowed his favourites down to sprinkles, lots of sprinkles, jelly tots and wafer butterflies. Waitrose have provided some easy to follow instructions and tips that I would really recommend taking a look at to give you some inspiration. Now, having never done this before we did have a tester egg that failed (although hubby quite happily ate it in pieces as it was dark chocolate and honeycomb!) The next attempt with milk chocolate was a success, I personally found the milk chocolate easier to fill the moulds with as it is thicker. I used the back of a spoon to smooth the chocolate over the moulds and built up the three layers, chilling in the fridge between each layer. We discovered that the edges of the egg needed to be quite thick to be able to prise it away from the mould in one piece so after the eggs had chilled for a couple of minutes I smoothed the chocolate further up towards the edges while it was still tacky. Then I let it chill in the moulds for a good hour before melting some more chocolate to stick the two halves together with. I decided to do these final stages while Lucas was in bed as he was impatiently prodding the egg to try and eat the chocolate! In the morning he came downstairs to a beautifully complete chocolate egg and I let him loose on his decorations! I dotted bits of melted chocolate all over the egg and let him stick what he wanted to it and then finally came the sprinkles…by far the most fun in Lucas’ eyes. You WILL need to hoover after this but I promise it is worth it! I have to say I’m pretty pleased with the finished egg, I love the colours and Lucas had so much fun making it. This will be a lovely Easter tradition we can start, and hopefully perfect as the years go on. 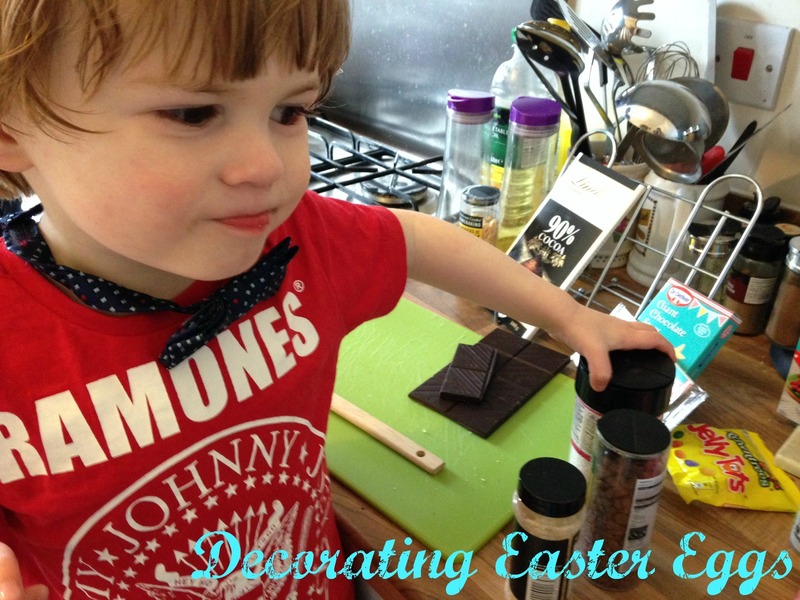 As he gets older there is so many fun activities we can do together and Waitrose have provided some great inspiration for this Easter. If the egg lasts it will be the Pièce de Résistance in our Easter Egg hunt on Sunday. This has been a great way to get creative in the kitchen and it will be especially good to be able to tuck into the finished product. As nice as Lucas’ looks I’ve really got my heart set on a more luxurious butterscotch creation so I think I’ll have another go in peace when all the littles are all in bed! Looks like so much fun and you can eat it too – bonus!